Stay at One of Sandals Resorts Brand New Destinations! Home > Sandals > Stay at One of Sandals Resorts Brand New Destinations! 09 Aug Stay at One of Sandals Resorts Brand New Destinations! Sandals Resorts are known worldwide for their all inclusive outstanding amenities, luxurious accommodations, exquisite food and the amazing destinations that offer couples romance and a perfect start to a life with beach wedding or honeymoon. The two new additions to the Sandals Resorts Family is no less spectacular than the other resorts in the Caribbean, Sandals LaSource in Grenada and Sandals Barbados. If you gravitate to the words “all new” or “completed remodeled” then Sandals Barbados is the destination for you. Set to pen January 28, 2015, the resort was purchased from Couples Resorts. The newly christened Barbados location will have 11 restaurants (we hear the first Indian style restaurant will be located here) and a complete renovation to the 280 guest rooms on the property. Look for additions to include a exclusive Club Sandals Lounge, A Departure Lounge, and an expansion of their signature Spa The Red Lane. If you are looking for a destination wedding, Sandals Barbados will offer an exclusively-designed wedding garden. Of course, their signature swim up pool bars, along with fire pits and a beachfront whirlpool also await guests at the January opening. 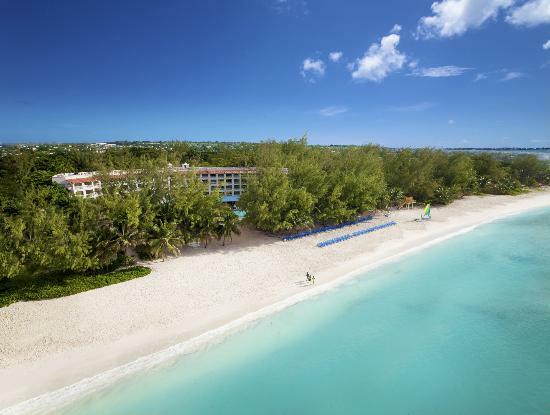 Sandals Barbados has a variety of accommodations to suit a wide range of budgetary guidelines. A couples vacation, honeymoon or destination wedding will be perfect when you book at Sandals Barbados. Go for the outstanding, newly re-imagined and renovated resort and enjoy the romance, relaxation, adventure and attractions- just for the two of you. You can’t prepare yourself for the experience you are about to have when you choose a couples vacation, honeymoon or destination wedding at the Sandals LaSource in Grenada . At the Grenada Sandals Resort relaxing, blue, sparkling, clear pools are everywhere. They are in the sky, they are in your living room, they are private, cascading, plunging and meandering. Known around the world as the Spice Island, Grenada is a paradise due to its natural beauty, pristine beaches, crystal clear blue water and exotic smells of the island, cinnamon, ginger, cloves and nutmeg. Looking for a resort with unlimited activities, the Sandals Grenada offers its guests motorized and non-motorized water sports, land sports, entertainment (with theme night parties) and unlimited scuba diving. Extras include local tours, Red Lane Spa Treatment and private pool side cabanas. The Sandals in Grenada has 225 rooms and suites, a state-of-the-art fitness center and spa, 10 restaurants (the first ever Sandals steak house) 69 professional English Butler Suites (available at the very highest level of accommodations), 3 freshwater pools and 2 river pools, soaking tubs in all South Seas and Italian Village rooms and luxurious accommodations beyond your imagination! All for an all inclusive fee at many different price points. Grenada may not be the most talked about place on the map- yet. But we assure you that when you take a couples vacation to this extraordinary property you will be telling your friends and family about your magnificent experience to this Sandals location for years to come. To book your all inclusive vacation, honeymoon or destination wedding to one of these resorts, call the Travel Agency that is a Certified Sandals Specialist, has been the largest seller of Sandals Resort Vacations 4 years in a row and has the Better Business Bureau stamp of approval, Enchanted Honeymoons Travel! Use the experts at Enchanted Honeymoons Travel to help you choose the perfect destination for your romantic get-a-way today!